When Are Calla Lilies in Season? When calla lilies (Zantedeschia spp.) bloom, they make a visual splash in the landscape, but their ornamental assets don't end there. The subtropical plants' blooms are used in cut-flower arrangements, with the flowers massed on their own or mixed with other kinds of flowers and plants. Of the eight calla lily species, white calla lily (Zantedeschia aethiopica) is the most common. It and other calla lilies grow as perennials outdoors all year in U.S. Department of Agriculture plant hardiness zones 8 through 10. Calla lilies are in season, or bloom, from early spring into summer. Each of the white calla lily's flowers is composed of a white spathe that surrounds an erect, yellow flower head called a spadix. Some calla lilies' flowers, or spathes, are greenish or yellow. 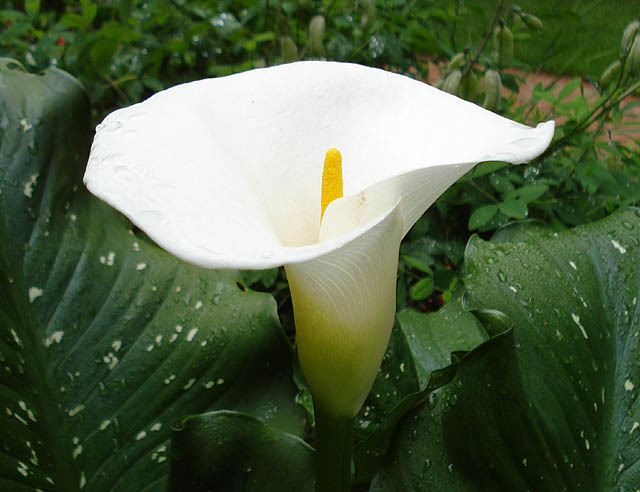 Grow white calla lily in full sun to partial shade. Some other calla lily species, however, need partial shade. All calla lilies require moist to damp soil; they can even grow in wet, boggy areas. Space multiple calla lily plants 12 to 18 inches apart in a garden. Begin fertilizing calla lilies in spring when their new growth begins. The fertilizer helps to ensure a strong flowering season. Use a controlled or slow-release fertilizer, such as a granular 12-4-8 product. Sprinkle the fertilizer evenly on the soil surface around each calla lily, using 4 tablespoons for a 4-square-foot area, and then water the soil. A garden bed that is 2 feet wide by 2 feet long is 4 square feet. Fertilize every three months in spring and summer, and then discontinue fertilizing in late summer. Give water to your calla lilies weekly, or as often as necessary to keep their soil consistently moist. Apply the water slowly, allowing it to soak into the soil around the plants' roots. The plants need regular intervals of abundant water to flower well. Cut a calla lily flower when its spadix -- the erect flower head -- is just visible inside the unfurling spathe. Use a sharp knife to cut the fleshy stalk, or stem, just above where it disappears into the leaves. Make the cut at a 45-degree angle. Take a bucket of water to the cutting garden, and place the cut end of each flower stem directly in the water as you harvest the flowers. Before and after cutting calla lilies, disinfect the knife blade by soaking it for five minutes in a solution that is equal parts rubbing alcohol and water, and then rinse the knife with fresh water or let the air dry it. New flowers continue to emerge from calla lilies' rhizomes through the spring and summer flowering season, allowing you to keep arrangements fresh with cut flowers. Cut calla lily flowers can last up to two weeks in a vase, and giving them a homemade flower food helps keep them fresh. Place 1 quart of lukewarm water in a 2-quart jar to begin making the flower food. Then mix in 2 tablespoons of lemon juice and 1 tablespoon each of sugar and bleach. Shake the mixture gently, and put it in the vase you'll use for flowers. Keep the cut flowers out of direct sunlight, away from heat and away from air conditioners and other chilly drafts, which speed their wilting process. To help get the longest life from your cut flowers, keep them 65 to 72 degrees Fahrenheit. After they finish flowering, calla lily plants need to go dormant in fall and winter to bloom well the next growing season. Allow their leaves to die back naturally and their soil surface to dry between waterings. When the leaves die back completely, it is OK to cut them back at the soil level to tidy the garden. If you live in a mild climate, where calla lilies stay green all year, then allow the plants' leaves to grow throughout winter, but discontinue watering and fertilizing the plants. North Carolina Cooperative Extension: Zantedeschia Spp. Can Easter Lilies Be Cut Back?